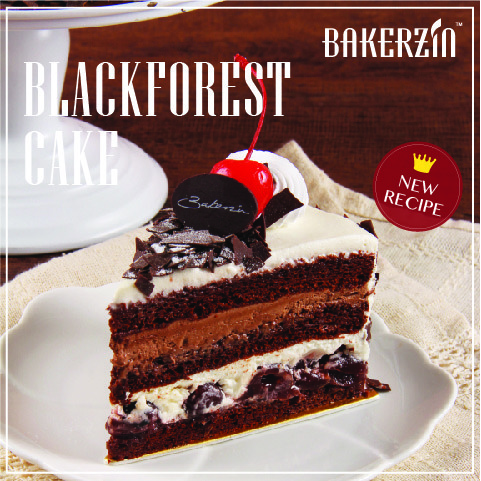 Bakerzin’s Blackforest is back with a smacking new recipe! Tuesday | April 10, 2018	Bakerzin’s true blue Blackforest Cake is back with a smacking new recipe, twice as delicious, and heartier! The chocolate cake sponge is baked to perfection, soft and moist, then soaked in kirsch cherry juice for optimum flavour. The cream of the crop is the kirsch cream, layered to satisfaction, each mouthful with one bite, not forgetting the brandied cherries and chocolate mousse on each different layers giving different taste texture! Available now at all Bakerzin retail outlets and online.